A few weeks ago I received 3 pairs of sunglasses. After doing some research on the company, and watching quite a few reviews on Retro City Sunglasses I decided to get a few for myself. The company is rather small However, their reputation, and customer service is phenomenal. I've had my fair share in bad experiences with people in customer service, and always wonder how the heck they got that job. I HATE poor customer service. It might be because I did work customer service for over 7 years maybe I just expect a lot from people in that field, but it is their job they should know how and how not to talk to people, and treat their customers. HELLO hardly ever do we hear how many people LOVE'd a restaurant now a days. We only hear the bad. Therefore, don't piss people off. Overall I was very surprised with the quality of these because they were so inexpensive. 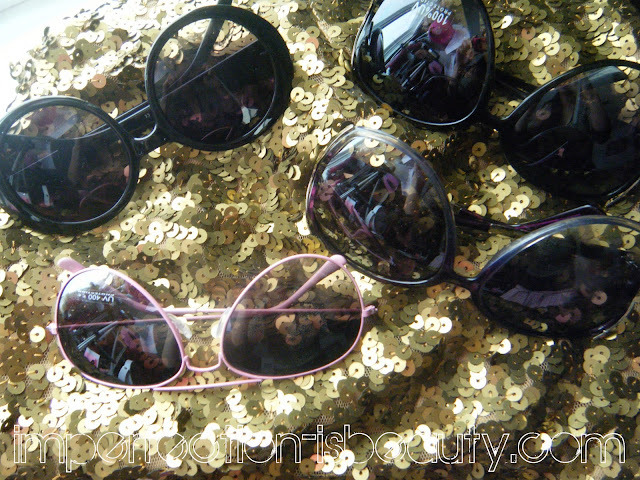 All are 100% UV protected so you don't have to worry about the sun bothering your eyes. I have thinner eyelids so my eyes are quite sensitive to the light so I definitely need a pair that is going to help the sensitivity from the sun. I find a lot of cheaper sunglasses don't usually do the job, and I can't wear them on really sunny days. So I was extremely pleased to see these I can actually wear as an everyday pair of sunglasses. Another thing I noticed is the plastic isn't your normal thin plastic. Its pretty nice and I don't have any irritation with the ear piece behind my ear. I also really like the fact they are so accessible, and reasonable priced. I tend to loose, or break my sunglasses pretty often so spending hundreds of dollars isn't something I like to do on a ton of sunglasses. I did notice that all 3 pair's aren't on the site as of right now, I emailed the company and I was informed that they are out but will be back in stock if you were looking for any of the pairs I got. Read More for a chance to win a pair!! - Comment on this video if you haven't already letting me know what your favorite pair of sunglasses off the Retro City site is. - You must be at least 16 years of age OR have permission from your parent/guardian. -All other rules are in the video info box that you comment in. These retro shades look good on you. They have great glasses!!! I left a comment on your YouTube channel already. Thanks for the giveaway!! 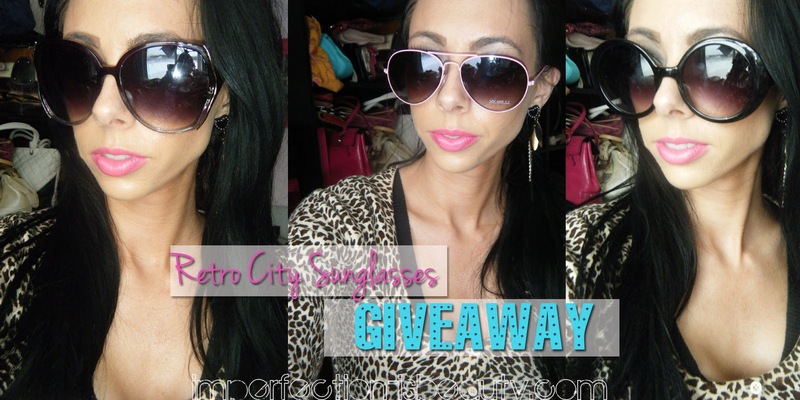 I also launced a giveaway yesterday & would love for you to enter.